This year’s edition of the TEN-T Days trade fair was held in Ljubljana, Slovenia, from 24 to 27 April 2018, welcoming more than 2,000 attendees, including the representatives of 26 Ministries of Transport from around Europe. 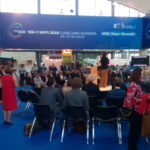 Ministers, European MEPs, and European Coordinators met with representatives of the European Commission at the trade fair to discuss advanced in the implementation of projects supporting the trans-European transport network (TEN-T). 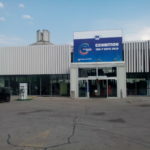 The Upgrade of Gabčíkovo Locks project was represented with a dedicated exhibition stand over the entire TEN-T Days event. 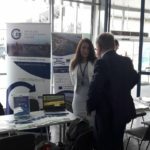 Representatives of the Waterborne Transport Development Agency kept attendees and others interested in the project abreast of the latest project developments, its activities and progress pursuant to the project plan. 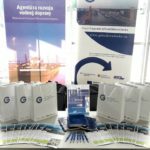 Attendees also received presentational materials for the project and had the opportunity to watch a short video produced by Vodohospodárska výstavba š. p. on the preparatory phase for construction of the project, and specifically the process of enclosing the locks at Gabčíkovo Waterworks. The trans-European transport network (TEN-T) represents a complex network of transport systems sponsored by the European Commission and focused on the implementation and development of a Europe-wide network of roads, railways, inland waterways, ports, airports and railway terminals. The primary objective of TEN-T is to remove barriers and deficiencies that exist between transport networks in the EU member states and to thereby improve social, economic and territorial cohesion in the European Union. The Danube is more than the main artery of the multi-modal Rhine – Danube TEN-T corridor. The Danube waterway, as a waterway of international importance, must meet inland waterway classification requirements, which it currently is unable to do due to deficiencies in the required navigable channel parameters during the navigation season.